» Blogs » Make Money Online » How to be a Website Traffic Reseller - Make Money Online By Selling Traffic to Websites ? How to be a Website Traffic Reseller - Make Money Online By Selling Traffic to Websites ? 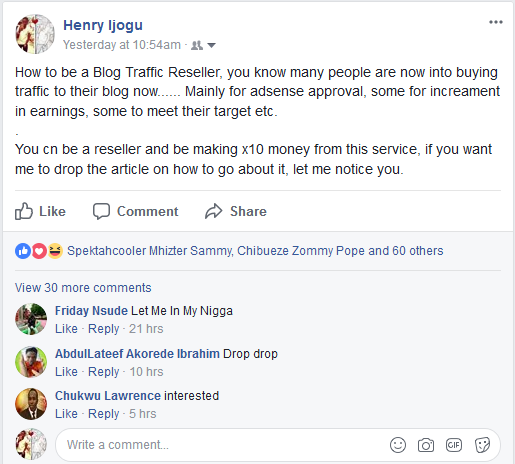 I tried Making a research via facebook to know how many people might have interest in Blog Traffic Reselling Program, i was stunned with the outcome of those who might have interest in making money as a blog traffic reseller then i decided to put up this article to guide those who might have interest in the scheme. Traffic re-selling is a huge business that is constantly expanding, every single website requires traffic this means your service is always in high demand. We provide our resellers with the tools and support to become highly successful resellers. Here I Shall be bringing in TrafficBot.Co.Uk Because of their lowest prices on the market and also because many of their customers resell TrafficBot traffic to their own customers. And in the last 2 of them of them you can have your own traffic reselling website or accept the orders from your clients privately. If you accept orders yourself you are welcome to use any pricing model with your clients and increase the prices as high as you can or want, if you Google this now you can see that many websites use 1.5x or even 2x higher prices than TrafficBot do, so you can put the difference in your pocket. Also you can even lower The Amount or prices you buy From Trafficbot by purchasing the credits in advance, in bulk, for example, if you make a purchase of 5 credits then you automatically get a discount of -20%, and for 10 credits they give -40%. The credits do not expire on your account, so you can resell them at any time in the future to your clients. Reselling as an Affiliate is the easiest and the fastest way to start earning money with Trafficbot, you just use your affiliate link to send the traffic to Trafficbot and from each of the sales your clients made you receive a commission, all the commissions are recurrent and you receive payments from all the sales with no expiration date. Note: I recommend this for those of us who dont have capital to invest. payouts are made to your PayPal account with the minimum of $100. Keep in mind that you are not allowed to be your own referral and Trafficbot strictly check all their affiliates for it, if they detect such activity they may block your reseller account and you will loose the earnings you have nade so far there you should abide by this and work hard for your earnings. This is the simplest way to start being a traffic reseller but in the same time it requires more manual labour of creating and controlling the projects. Majority of resellers use this particular method, therefore i encourage you to start with it and once you have stable income from your clients you may advance to the next level – Automated Traffic Reselling. In case of receiving any complaint from the customer that you cannot handle by changing your project’s settings you can simply forward it to support@trafficbot.uk or you use the TrafficBot Live Chat (This is Recommended). Keep in mind that TrafficBot will always ask for your Google Analytics daily page views report’s screenshots or access to it for their user in case of you not receiving the proper amount of traffic. The advantage of this method is that none of your clients will ever know that you purchase the traffic from Trafficbot.co.uk, so you can focus on your own marketing and sales and not to bother about the buying traffic ok??. Its only Disadvantage is that you cannot activate customers’ orders immediately and you have to create orders in our member area manually. This is the most advanced method of reselling traffic and it actually requires quite a lot of preparatory work from your side. Automated Traffic Reselling presumes that you already have a website where your clients can put orders and this website is connected to TrafficBot server using their Reselling API. You can find the API’s specification in your member area after registering by clicking at API link in the Automation section of the main menu. With API you can automatically check your balance, create, edit, pause, resume and check status of your projects. Using API requires some programming skills. The advantage of this method is that you have your own website and none of your clients will ever know that you purchase the traffic from anywhere, so you can focus on your own marketing and sales and not to bother about the buying traffic. You maintain your own brand and all your customers will be loyal to you. Also you can fully automate selling process and activate the projects immediately once your customer places an order. With every purchase you made on TrafficBot you receive 1 free demo credit on your account, so you can use it for demo purposes for your clients *isnt that awsome?*. Keep in mind that demo credits can only be used for the domains that are not TrafficBot database yet and they cannot be used for short links, redirects nor for affiliate links. I suppose this article is worth sharing with friends vis social medias, please kindly drop your reviews and comments about this Money Making Scheme you jusr read. Thanks. Title : How to be a Website Traffic Reseller - Make Money Online By Selling Traffic to Websites ? 1 Response to "How to be a Website Traffic Reseller - Make Money Online By Selling Traffic to Websites ?"